The Chapelton masterplan is inspired by the vibrant urban settlements of northeast Scotland, such as Montrose, Stonehaven and St Andrews. Like these historic towns, Chapelton includes many types of traditional homes, in walking distance of attractive parks and community facilities. The town’s seven pedestrian-scaled neighbourhoods are designed to be inherently sustainable, and will be desirable and fulfilling places to live and work. The initial masterplan proposes the development of 4,045 houses, along with all associated uses, such as shops, offices, parks and schools. These houses will be located in four neighbourhoods, the first of which will be Cairnhill. A town centre, including a main high street for Chapelton, will follow in a subsequent phase. 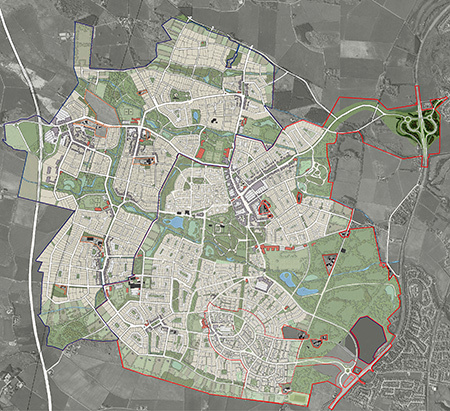 Longer-term, the Chapelton site can accommodate up to 8,000 houses within seven neighbourhoods. Parks and landscaping are an important part of the Chapelton masterplan. The network of streets and parks will follow the features of the site’s landscape, incorporating the contours of the land and existing trees and woodlands. The street network will maximise views, including the sea views from the neighbourhood of Cairnhill. Most of the site sits within a large bowl, so it will remain largely unseen by the existing settlements in the area. The town masterplan was developed in consultation with over 5,000 local residents, as well as local professionals, Council officers and Scottish national agencies. Feedback received during this consultation process has shaped critical elements of the town, as well as the architectural plans.